LUVERNE NERF BARS/BOARDS - The Topper Shop Inc.
For us, classic doesn’t mean outdated. It means tried and true. And when you combine the uncompromising quality of stainless steel with a tried-and-true design, you get side steps that will prove themselves over and over again. LUVERNE side entry steps feature a classic, contoured design that mounts flush to your vehicle’s rocker panels and provides 7″ of comfortable, non-skid stepping width. 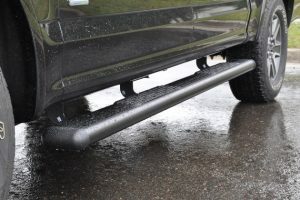 These side steps are made to stand the test of time with stainless steel construction, durable black plastic end caps and two finish options for you to choose from. For functionality and a contemporary style, LUVERNE O-MegaStep™ 6″ oval steps provide safe, customizable footing for your vehicle. They feature no-break polypropylene step pads that mount with self-tapping screws to allow for custom positioning. With T6 aluminum construction, paintable TPO end caps and two finish options, LUVERNE O-MegaSteps™ are the ultimate in customization. Built on the idea that a deluxe ride needs a deluxe entrance, these 7″ ovals have a width comparable to some of the largest running boards available. 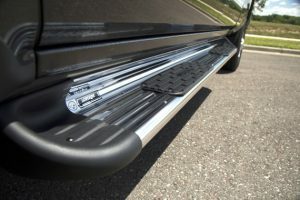 This, combined with the classic styling of popular nerf bars, allows Regal 7 Oval Steps™ to easily live up to their name. The unique look and function of Baja Steps™ comes from their patented drop-down step design. The steps are specially made for off-roading, featuring a 3 1/2″ x 12″ stepping surface that is low enough to provide a comfortable step up, but elevated enough to clear rocks, logs and other off-road obstacles. We take the off-roading concept a step further by constructing Baja Steps™ from stainless steel and covering them in a black powder coat finish. 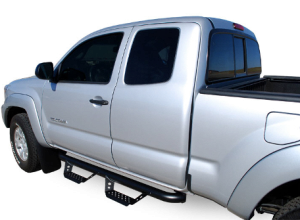 This textured black powder coat not only adds a professional look but also maximizes rust resistance. Baja Steps™ are also available in polished stainless steel.